With Meike Schalk, Roemer van Toorn, Sandi Hilal and Alessandro Petti, Helena Mattsson and Heidi Svenningsen Kajita. Module 3 “Situating knowledges” will function as a forum for reflection on the presentation and dissemination of knowledge in and through your project. It focuses upon the different strategies and methodologies you employ in your research. Terms and concepts such as the archive, the anthropocene, the laboratory, performance, etc. will be discussed in relation to current discourses on representation and knowledge in architecture, art and design. Module 2 “Exhibitionism” investigated and developed strategies for presenting and disseminating outcomes in practice-based research through the format of an exhibition. Expanding on your field of references, you explored and invented more specific and subject-related means for presenting and disseminating your research. The module included a site visit to ArkDes, a walking seminar, lectures, presentations and discussions. Module 1 “Staging the Message” was concerned with forms of representation employed in research, and the significance of media or form in and for the dissemination of knowledge. We discussed different means for representing research in relation to content, method and modes of inquiry. From the outset of your own research, you have expressed – in your plot – an individual standpoint concerning issues of the representation and dissemination of your research project. 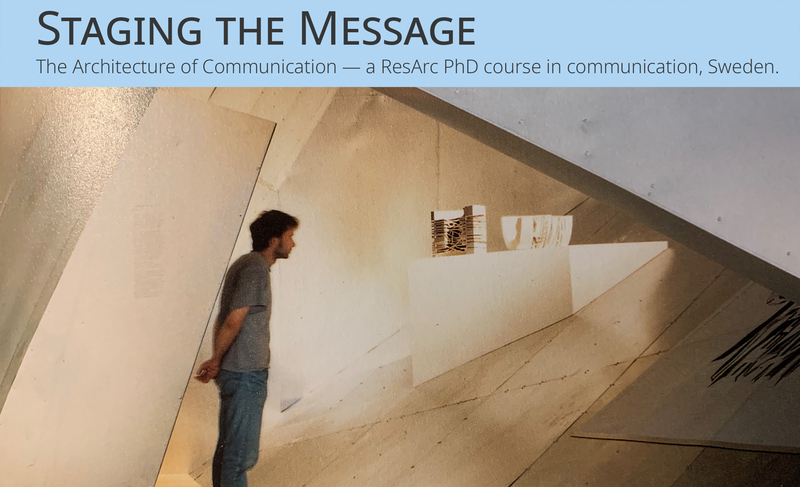 we are looking forward to welcome you to take part in the third Module of the ResArc Communication course the 27th, 28th and 29th of March in Stockholm. For the upcoming module we ask each of you to prepare a 15 minutes presentation (to be uploaded to the website as conference paper 25th of March – 15 minutes is three pages in typeset “times new roman” 12pt/ca. 1500 words). The main idea is that you situate your research within a research milieu. The idea of “Situated Knowledges” – following Donna Harraway (1988) – is about knowledge placed within a context, being part of a specific discourse. This context can concern many different milieus: socioeconomic, sociological, technical, historical, material, theoretical, cultural or otherwise. It is about the point of view your research takes within this context; to be aware about the context you operate within; how your research positions, situates itself among its peers; what audiences it has in mind and what kind of conversation it contributes to (constructs). The advantage of situating your research knowledge is that – in opposition to objective knowledge – your discussion becomes far richer in content when it takes into account and reflects upon the numerous bits of information constituting the context and environment of that point of view. In fact, we ask you to make a reflective and theoretical inquiry into the material you have presented to us so far; develop and present a theoretical reflection on your “cases”, formulate concepts, locate/find related and relevant research and literature situating your research among peers, AND indicate which audiences you are addressing. Focus hereby upon issues of dissemination that you are encountering within your own processes and, by doing so, also consider questions related to the dissemination of research in the field of architecture, art and design more broadly. We will group each of your specific presentations of situated knowledge under four topical themes, headed by a “ peer-reviewer” (see schedule). This format will enable us to speak about your individual research and to reflect upon the larger context we, as different researchers, together with our references, constitute. Each session comes with few literature suggestions. The literature will be added to the Communication page in the weekend. Each group, please consider yourselves as a research collective and throw in a short text (it can also be an excerpt) that is crucial for your situated research (please upload it on the Communication page and share it within your group and your peer reviewer). “Peer-reviewers” will give short introductions of ca. 15 minutes followed by your presentations under four themes. Specific literature for each session will be uploaded. If you feel your project fitted better within a different context, please let us know. Note, the sessions could be moved to another date / time. History is elusive. To recall the multifaceted past is to set a historical scene, to select the objects, to combine them into stories made up by chains of events, to construct a narrative. When writing architec­tural histories, the building and the archive are usually seen as preconditions for historical inquiry; the archive is understood as the base upon which the narrative is built. There is, however, another possible way of thinking; rather than a static collection of documents, the archive could be conceived as an active tool and agent for writing history. As the world changes, architects and designers have searched for innovative ways to conceptualize and practice architecture. This panel will focus on practitioners’ way to develop new modes of inquiry; methods, tools and instruments, when confronted with emerging challenges. Rites of passage mark periods of transition and liminal spaces in the life of individuals and communities. These constructed moments and sites of becoming can be found in all cultures in forms of rituals, trials, re-enactments, and performances that focus on transformation. Anthropologists and other social and cultural researchers have explored the subjunctive, reflexive, and communal dimensions of the limen (meaning Threshold) that experiential “realm of pure possibility” apparent from “ritual to theatre” and beyond. Dana Cuff, “Introduction: Architecture’s Double-Bind”, in C. Greig Crysler, Stephen Cairns and Hilde Heynen (2012), The SAGE Handbook of Architectural Theory. London: Sage, 385-392. D avid A. Barber, “Militant Architecture: Destabilising Architecture’s Disciplinarity”, in Jane Rendell, Jonathan Hill, Murray Fraser, Mark Dorrian (eds) (2007), Critical Architecture, London: Routledge, 57-66. Martin Ávíla, Henrik Ernstson, “Realms of Exposure: On Design, Material Agency and Political Ecology”, in Henrik Enstson, Sverker Sörlin (eds), Grounding Urban Natures: Histories and Futures of Urban Ecologies, MIT Press, forthcoming. See also “Earth Stalked by Man” by Anna Tsing. Sandi Hilal is an architect and researcher, born in Beit Sahour, Palestine, based in Stockholm. Currently, she is research fellow at ArkDes, Stockholm. Previously, she headed the United Nations Relief and Works Agency for Palestine Refugees in the Near East (UNRWA) Camp Improvement Program in the West Bank (2008–2014). Togehter with Alessandro Petti and Eyal Weizman, she is a founding member of DAAR, an architectural studio and artistic residency programme that combines conceptual speculations and architectural interventions (www.decolonizing.ps). Alongside research and practice, Hilal is engaged in critical pedagogy and together with Petti she is a founding member of Campus in Camps, an experimental educational programme hosted by the Phoenix Center in Dheisheh Refugee Camp, Bethlehem (www.campusincamps.ps). Together with Petti, she pursues artistic practice that is both theoretically ambitious and practically engaged in the struggle for justice and equality, where contemporary art exhibitions are concurrently a site of display, material production, research, and political imagination. The pair has participated in various international exhibitions, among them the Biennale di Venezia (2003, 2008, 2009, 2013, 2015), the Istanbul Design Biennial (2009), Home Works Beirut (2010), the Biennial de São Paulo (2014), the Asian Art Biennial (2015), the Marrakesh Biennial (2016), Qalandia International (2016), alongside others. Helena Mattsson is professor in Architecture History and Theory at KTH School of Architecture where she has served as the head of school between 2016-2018. Her research deals with the architecture of the 20th century welfare state and contemporary history with a special focus on the interdependency between politics, economy and spatial organization. She has published in journals such as Nordic Journal of Architecture; Journal of Art History and Journal of Architecture. She is the co-editor (with S-O Wallenstein) for Swedish Modernism: Architecture, Consumption, and the Welfare State (London: Black Dog Publishing, 2010), the themed issue of Architecture and Culture, “Architecture and Capitalism: Solids and Flows “Architecture and Capitalism,” 2017 (with C. Gabrielsson), and the forthcoming book (with K. Cuper, C. Gabrielsson) Neoliberalism: An Architectural History (Pittsburgh: University of Pittsburgh Press). She is currently working on books on postmodernism, politics and the welfare state in Swedish architecture. She is a member of the editorial board of Journal of Architecture, and together with Meike Schalk and Sara Brolund Carvalho she is running the research collaboration Action Archive. Heidi Svenningsen Kajita, is an architect and postdoc at KTH School of Architecture, since 2019. She holds a PhD (2016) from the Royal Danish Academy of Fine Arts Schools of Architecture, Design and Conservation (KADK). Her dissertation is entitled: Fragile Potentials in the Big Plans: spatial and material dimensions of post WWll large-scale housing estates in use. This practice-based research has been exhibited and presented widely. She is also a long-time teacher of architecture and the co-founder of Bureaus, a platform for spatial research, design and strategies. Her research interests in the fields of architecture and urbanism include: transformation of Welfare State housing in Northern Europe; critical examination of architectural design processesincluding technical literature and architectural drawing; andarchitectural-ethnographic methodology.